Finally it's letting me post the pic of the unfinished-finished snowman ornie I wanted to post last post. Woo Hoo! Is it just me or does this snowman have a long nose? Hmm, makes ya wonder doesn't it? So today should of been my last day to work on 6 Fat Men on my rotation schedule. I've really been struggling with that 32 count. But man, today was super bad. My eyes crossed, they watered, they stung, I miscounted and had to rip stitches and I ended up in tears. I'm figuring maybe it's due to be soooo tired from not sleeping right. So I'm putting him away a day early and am just going to work on another easy snowman ornie. Tomorrow I will try working on A House is Made. It's on the count I'm used to and hopefully I will sleep better tonight, so maybe stitching will go better tomorrow :) I'm not going to give up on 6 Fat Men, I'll keep him in rotation, I may just have to go slower and less than a week with him. I don't want to get so frustrated with him that I do give up on him. So here is where I'm at with him now, after after to rip out the stitches that I had miscounted. Not far, sad to say. So there he is all bumpy and knarled up looking. But hey, that is learning :) I'm so tired right now I'm not even sure I will stitch right now. I think I will kick back and read. I refuse to take a nap, but reading sounds nice and relaxing, maybe I'll stitch after dinner and family night, or maybe I'll just stitch tomorrow when I (hopefully) feel more rested! Stay safe, warm, don't blow away, love your furs (and your humans) and stitch happy and avoid the frog! I think you are making great progress. I have not moved beyond Aida yet, so you are tons braver than me! I saw your post on Daffy's blog about not knowing if you had that word CAPTCHA turned on on your blog. Seeing as how I had to post on my own blog (I deleted it) to make sure I didn't, I thought I'd post just to let you know -- you have it off already. Hooray! I HATE those word things, especially teh ones that aren't words. Woo, another word verification free blog! Thank you, Shanda! 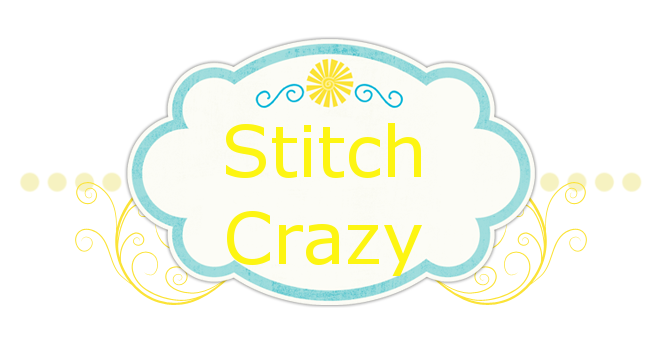 Oooo, I can never stitch when I'm sick or really tired. I end up frogging or repeating the same mistakes over and over. Keep working at it. You CAN handle this! Cute snowman. I also turned off my word verification. Love your snowman finish and great WIP too. Your snowman finish is adorable!! 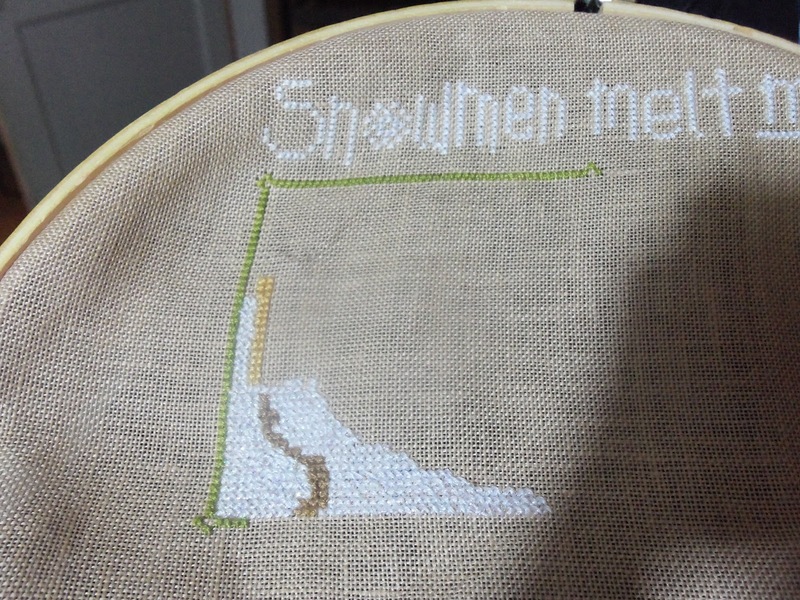 I find that when I'm tired, I don't like to stitch over-two. I've actually been using my mag eyes to stitch on 28 and 32ct lately and they've helped a lot. I don't get as much eyestrain. Nice start!! 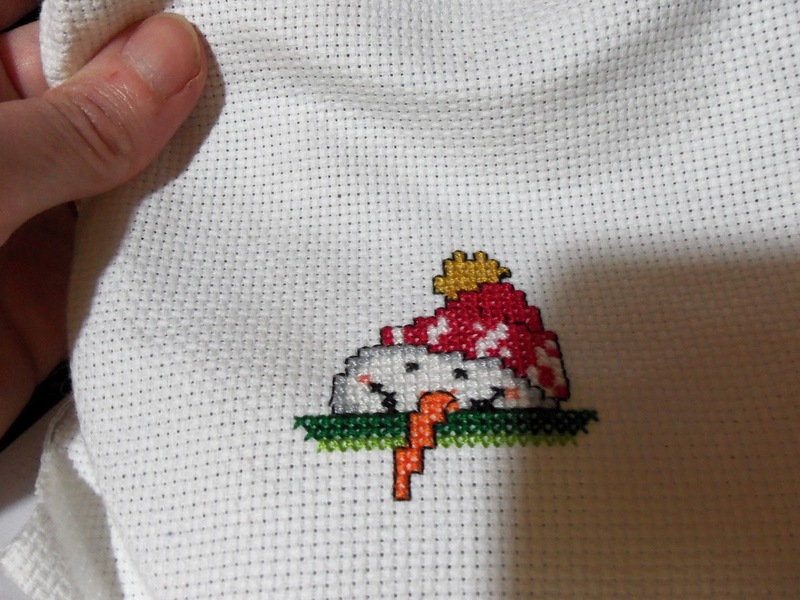 Hope you have as much fun as I am stitching these cute and fat snowmen.